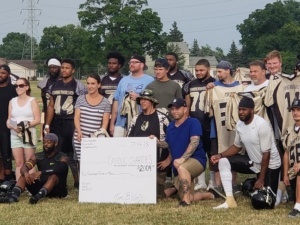 Catholic Charities of Southeast Michigan (CCSEM) teamed up with the Monroe Timberwolves semi-pro football team Saturday, July 14, to fight the opioid crisis. During this special fundraising event, the Timberwolves faced off against the Highland Park Polar Bears at Navarre Field, 301 Jones Ave., Monroe. Before the game, team members literally gave away the shirts off their back to those attending. CCSEM received a donation of $2,004 from proceeds raised, which will be used to help those suffering with mental health issues and addiction. CCSEM recently announced plans to open this fall the new Saint Joseph Center of Hope in Monroe to provide 24-hour crisis intervention to aid those suffering from drug and alcohol addiction. In partnership with ProMedica Monroe Regional Hospital, the center will be housed in a refurbished facility on the hospital grounds. Funding for the new facility will come from the Community Foundation of Monroe County Monroe Health Plan Endowment Fund, the Community Mental Health Partnership of Southeast Michigan, and St. John the Baptist Parish in Monroe through proceeds from the sale of the former St. Joseph Parish.